Coming in September we will be sitting down at "A Taste of Ely" every Thursday morning at 8:45 to sip a cup of great coffee and answer your questions. 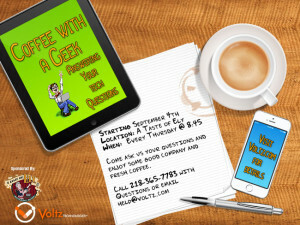 We invite everyone to come down, visit with us and ask us your technology questions, and have a bit of fun. If you want us to diagnose a laptop or a cell phone, we are glad to let you know what is going on with it and try and fix it in 15 minutes. If we can't fix it we will give you a coupon to visit us at Voltz for a full service repair. We charge a $10 diagnostic fee and if the item can not be fixed within this time frame, please schedule a time to bring in the item and we will credit the $10 against the in-store repair fee.